What a decadent twist on the traditional pumpkin pie! 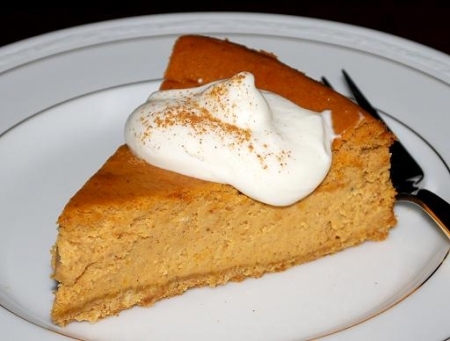 The creaminess of the cheesecake is a perfect match to mix up with pumpkin pie ingredients. A third less fat cream cheese and light sour cream are used to cut down on some of the fat and calories. Keep in mind this dessert requires at least 4 hours of chilling time. Make crust by adding graham crumbs to an 8 – 9 inch spring form pan. Melt butter in a small bowl in the microwave. Add butter to pan and mix well using your hands. Using your hands press mixture to evenly cover the bottom of the pan. Set aside. In a large bowl, blend cream cheese and sugars using a mixer. Mix until graininess is gone. Add pumpkin, eggs, vanilla, flour, cinnamon and nutmeg and mix well. Pour batter into the pan and evenly spread the batter. Bake in a preheated oven at 325 degrees for about 1 hour and 15 minutes. Remove from oven and let set until it is at room temperature about an hour. Place in the fridge, covered with plastic wrap or foil for at least 4 hours. Making the topping by beating all the topping ingredients except for the cinnamon together and spread over cheesecake prior to serving or add a dollop as you would whipped cream. Enjoy! Try tawny port, Robert Mondavi Winery Moscato D’Oro (Napa Valley), Dogfish Head Punkin Ale (Milton, DE) or Michelob Brewing Co. Jack’s Pumpkin Spice Ale (St. Louis, MO).